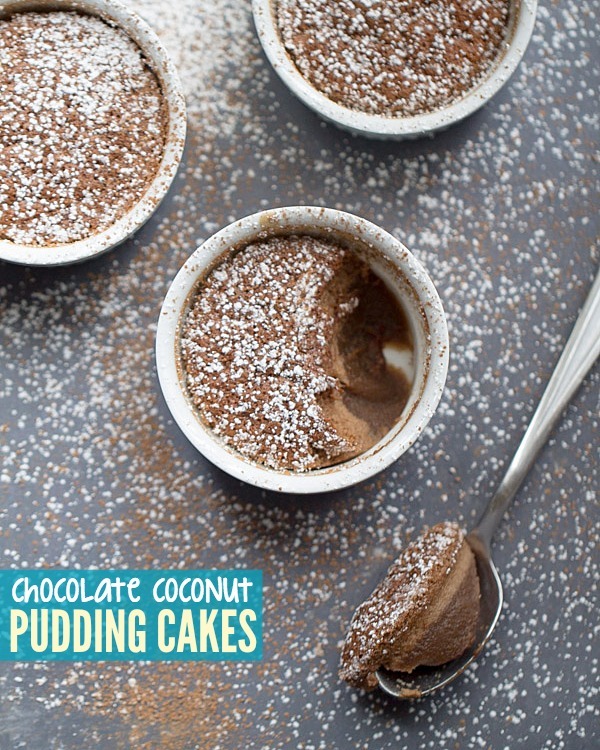 On a hot summer afternoon, enjoy one of these tasty dairy free Chocolate Coconut Pudding Cakes. 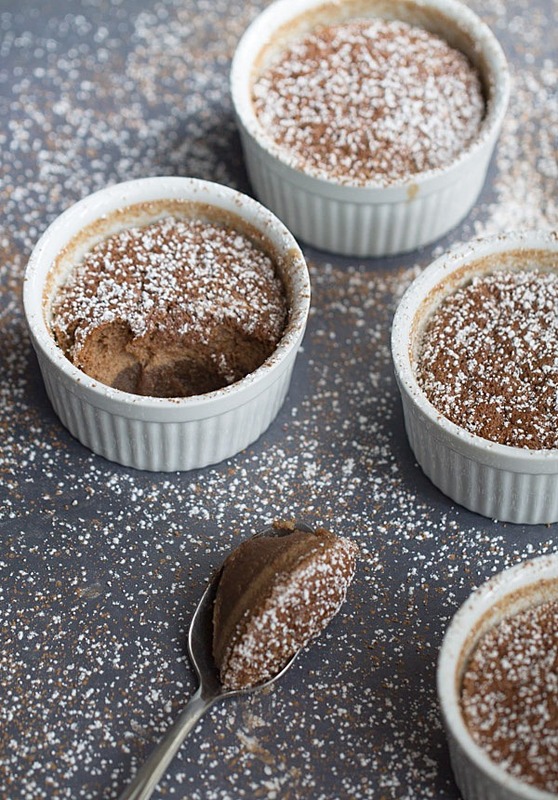 These little cakes are made with coconut milk, cocoa powder and Kahlua. I think I’m starting to transition into the person who would rather bake than cook. It’s probably just a phase I’m going through but I just feel so burnt out on cooking. And it’s hard to do cooking, cooking photography and the posts that follow when working full time. Add school and some training videos that will be beneficial for my job into the mix and you get one crazy, overwhelmed feeling gal. Which brings me to sweets and baking. I was never into baking until I started this blog. For one, it scares me. Plus, I was always the salty snack craving kind of gal. Give me chips, crackers, cheese and peanut butter and I’ll be quite content. Oh ok, the cookies and the brownies tend to win me over too. But typically not as much as the salty/savory snacks do. But alas, I’m starting to dig the idea of baking sweet or savory dishes. It’s a challenge for me. A huge challenge. I’m not too keen on the required baking ratios to pump out a perfect cake or cookie. I’m not really sure I could ever come up with my very own made from scratch recipe. But I’m pretty good at adapting recipes. So there’s that. I think it’s fun and quite the challenge to try to bake goodies. But I also like that it’s so much easier to fit into my busy schedule! For example, I can bake cookies, a cake, muffins, a pie, insert baked good here, in the evening or at night and then take the photos the next day. A while back, I made these dairy free Lemon Coconut Pudding Cakes. They turned out wonderfully and I immediately knew that I wanted to make a chocolate version. For the chocolate version, I used coconut milk instead of dairy milk. 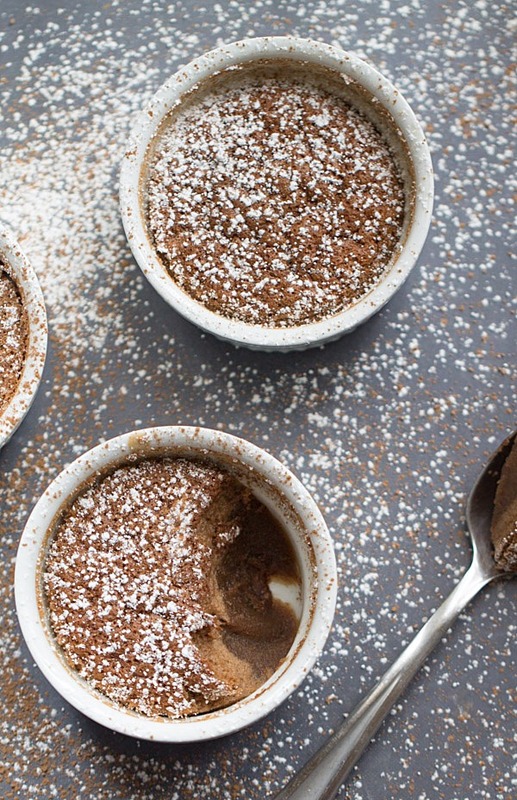 I used cocoa powder and Kahula to give this dish a deep chocolate and subtle coffee flavor. Much like the lemon pudding cakes, the pudding layer turned out more like a thick custard than pudding. But that can be attributed to the coconut milk. Coconut milk tends to thicken a recipe more than regular milk will. If you prefer to use regular milk, you can replace it 1 for 1. 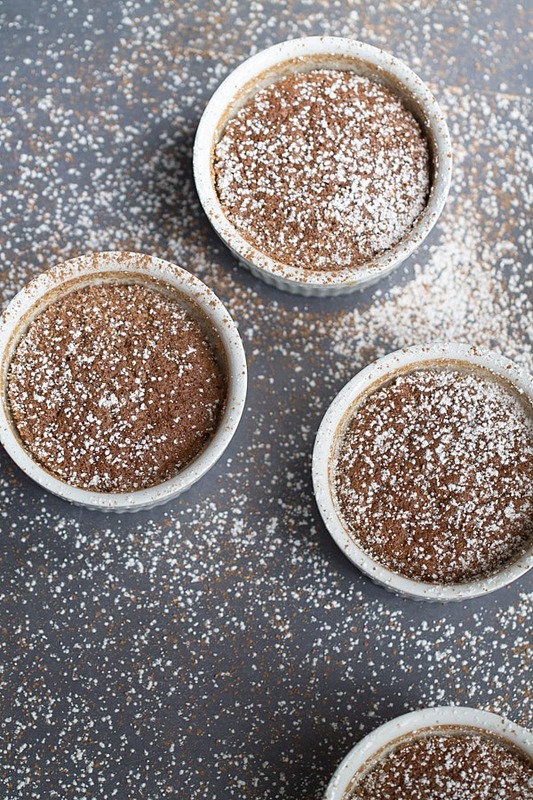 When making pudding cakes, it’s important to place the batter filled ramekins into a pan filled with water. The pan should be filled with enough water to come halfway up the sides of the ramekins. This allows the bottom part of the batter to cook slower than the top part. This creates the creamy, pudding-like consistency of the cakes. After baking and allowing to cool, dust the pudding cakes with a little powdered sugar. Then enjoy. Enjoy alone . Enjoy with a small scoop of vanilla ice cream. Cause there’s nothing better than a warm, gooey chocolate cake paired with a scoop of creamy vanilla ice cream. Place 4 1 C ramekins, plus more as needed, into a 13x9 baking pan. Fill with enough water to come halfway up the sides of the ramekins. In a small bowl, whisk together the flour, salt and cocoa powder. In another bowl, beat together the egg yolks and ¾ C granulated sugar until smooth. Gradually add the flour mixture and beat until thickened. Add the kahlua, vanilla extract and coconut milk and beat until smooth. In the bowl of a stand mixer, beat the egg whites until foamy. Add the remaining granulated sugar and beat until soft peaks form. Stir ¼ of the egg white mixture into the egg yolk mixture then add the remaining egg white mixture and carefully mix until no more streaks appear. Pour equal amounts of the mixture into each ramekin. Bake for 35-40 minutes or until the center is firm but slightly springy. Remove from the oven and allow to cool for 15 minutes. Keep the ramekins in the water during this process. 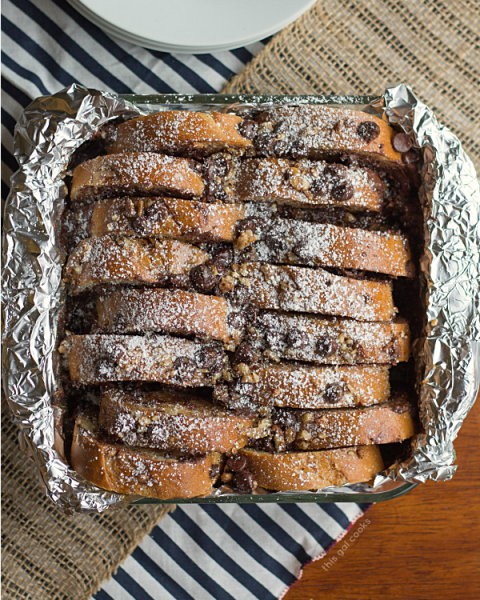 Or this Overnight Chocolate Pecan Pie French Toast Casserole. Chocolate for breakfast, YES! OMG. Julie these look incredible!!! Love that they’re dairy free too! Mmm …. impressed! Love the kahlua addition in particular! I’m exactly like you. I always preferred cooking rather than baking, mostly because I felt like I didn’t have to be so precise when following a recipe (or not), but since starting blogging I’m a convert! Now I have to ‘remind’ myself to cook something so that my blog doesn’t get too ‘lop-sided’ with baked things! P.S. Oh yes, and it IS hard to work full-time and blog. It’s honestly like having two full-time jobs, isn’t it? These look delicious! I love baking AND cooking and I struggle with not doing food EVERY day. lol I think I get most anxious over taking the pics, for sure. They look and sound amazing and I love the addition of teh Kahlua. Pinned! Oh well I think you are a phenomenal baker Julie!! These pudding cakes are a proof! Oooohh they look super yummy and the flavor combo sounds incredible as well! Pinned and saved for the next time I make dinner for my dairy-free neighbor, although I might have to make it sooner for myself first!! YUM! Oh my! I made lemon pudding cakes once and really liked them, but I am sure I would be infatuated with these. 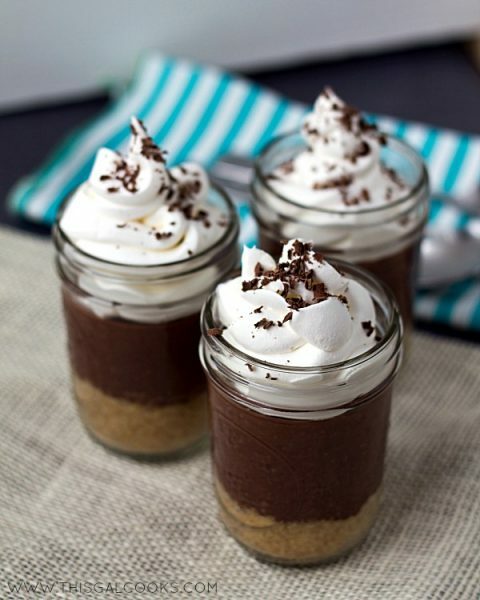 Love the chocolate and coconut combination. Pinning! 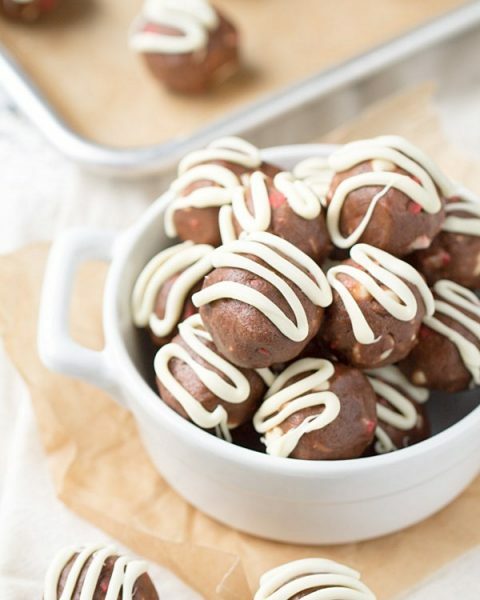 The chocolate/coconut combination is such a great combination. Thanks so much for stopping by, Christin! What a sweet little dessert. The Kahlua adds the bit of ‘special’ to the dish. I’ve (obviously) had a bent towards baking, but by the looks of your recent posts, you’ve been nailing the cooking posts! 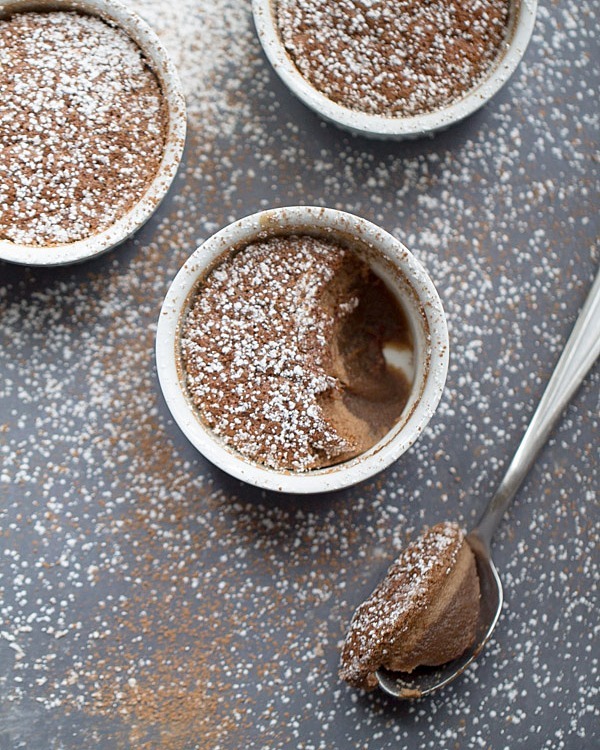 I am in love with these chocolate pudding cakes though – dairy free and Kahlua? Um, pass me the ramekin! I really like how you can see the layers, too. Talk about stunning! Pinning these, Julie! um a chocolate cake with coconut AND Kahlua?! Heaven!!! Definitely! Thanks for stopping by, Chandra!